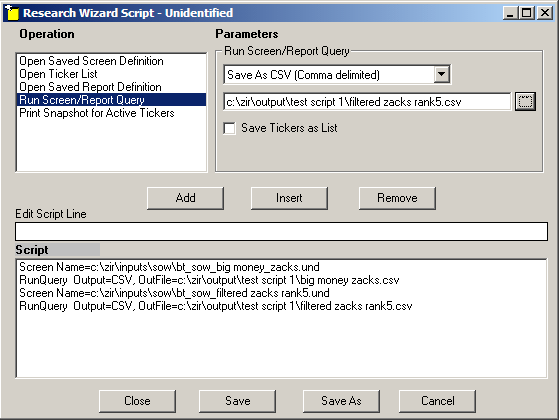 Whether you run multiple screens every day or several screens every once in a while, you can automate your screening routines with the Research Wizard’s Scripting feature. 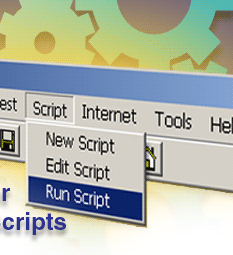 Instead of opening each screen one at a time and running it, then printing it or exporting it to Excel, you can simply open up one script and the program will do all of the rest for you. It’s quick, it’s easy, and a great time saver. Everybody has their favorite screens. And I’m going to demonstrate how to build a script with four favorite screens of my own. 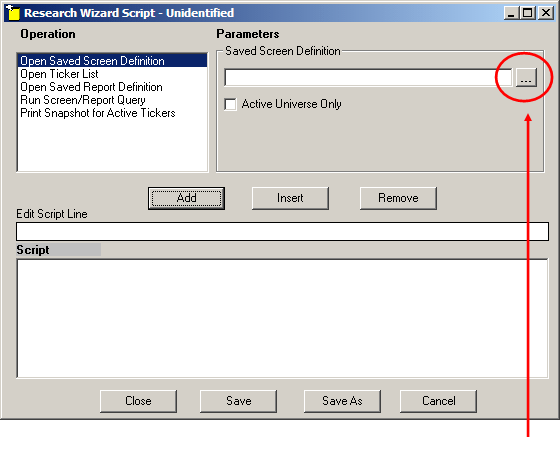 The Research Wizard Script window will pop up. The first ‘Operation’ is to choose a Screen Definition to open. To the right of the Saved Screen Definition box, click on the little button with the 3 dots (ellipsis) on it. The Screen Definition window will pop up. Go find your first screen you want to add to the script. In this example, double-click the SoW folder and then locate the screen labeled, bt_sow_big_money_zacks.und, select it, and click Open. Once you do, it’ll be put into the Saved Screen Definition box. Next, it asks if you want to open a ticker list. For this example, we’ll pass over this option. 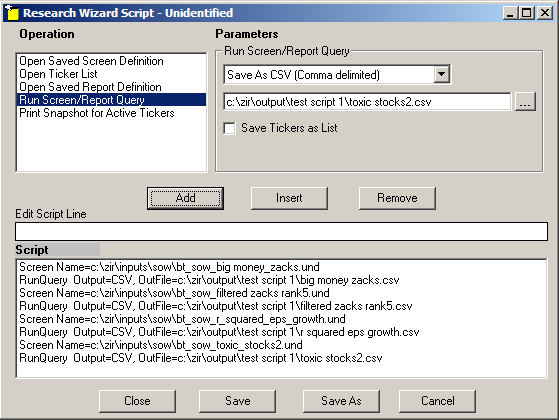 Note: the scripting process lets you open up screens, ticker list or reports. 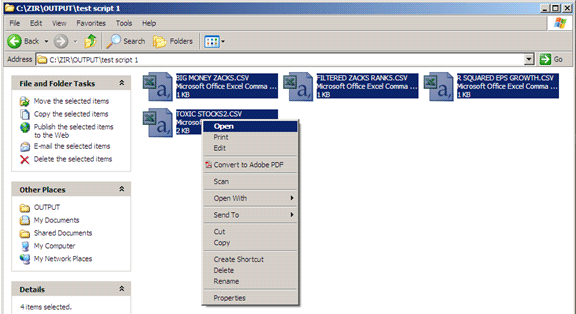 Each and every one of the above files, separately or together, can be put into a script. The next option is to open a Report Definition. Since the Screens we’re opening in this example, already have a predefined report attached to them, we can skip over this step as well. But if you’d to have a different report or specially created report opened, complete this step before moving one. 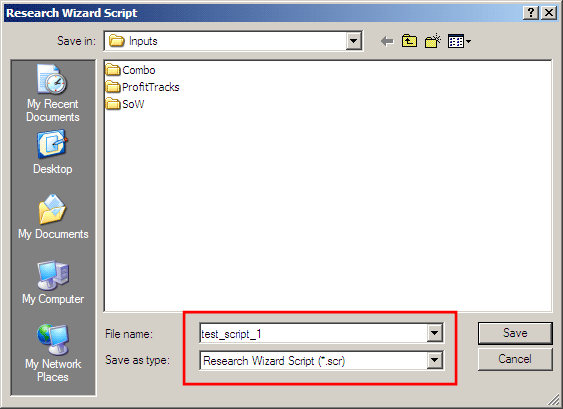 This command will direct the Research Wizard to start the Run Query command. 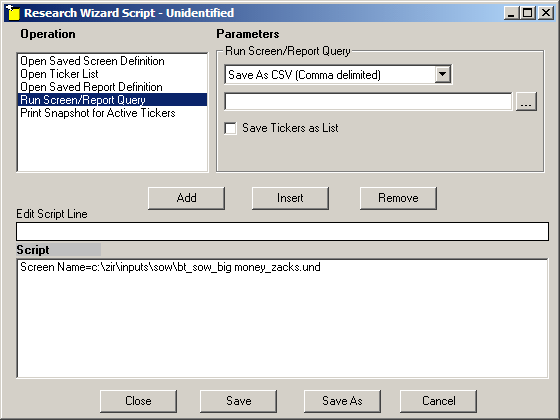 You have an option as to what the Research Wizard will do with this Report; it will either Print it, or Export the data to a file (Tab delimited, Space delimited, or Comma delimited – common Excel file format) and or save the tickers that come thru as a ticker list. 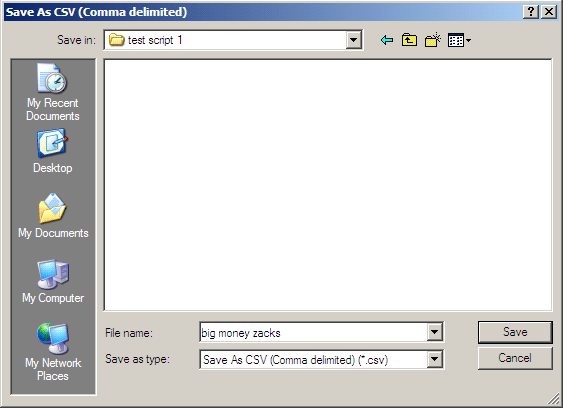 Instead, let’s explore the Save As CSV (Comma delimited) option. 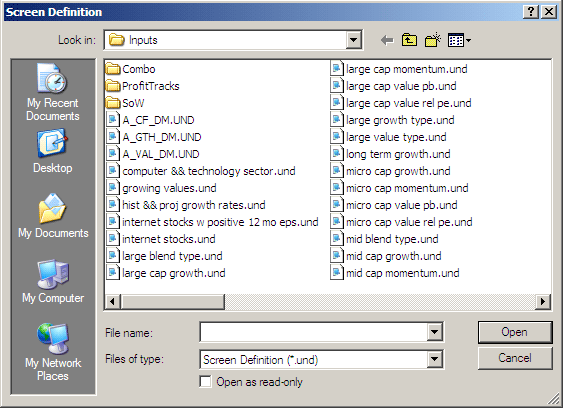 So select the Save as CSV option. You’ll see a new dialogue box displayed beneath it. Click the little button to the right of the box and either find the file you want the report output to go to or create a new Report where the screen results will be exported to. For this example, we’re going to create a new report and folder to keep them in. (Comma delimited) window will pop up. … and then doubl-click it with your left mouse so it becomes the active directory, i.e., it gets put into the Save In: box. the tickers will get exported to. The first set of commands for this script (open Screen, Run Query, Export results to Excel) is complete. Do the same thing for the other screens you want to add to this script. 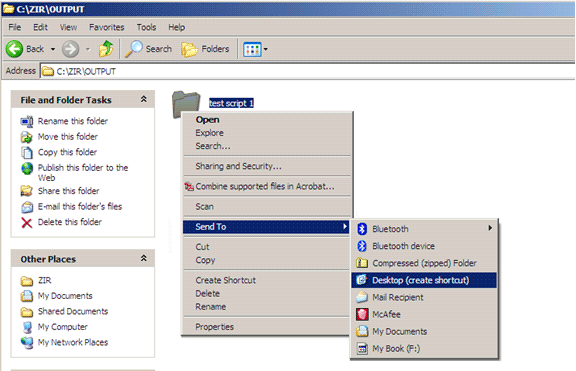 Click the ‘Open Saved Screen Definition’ option in the Operation window. Find the screen you next want to add to your Script. For this example, it’s bt_sow_filtered_zacks_rank5. Then click the Add button to add it to your list of commands. 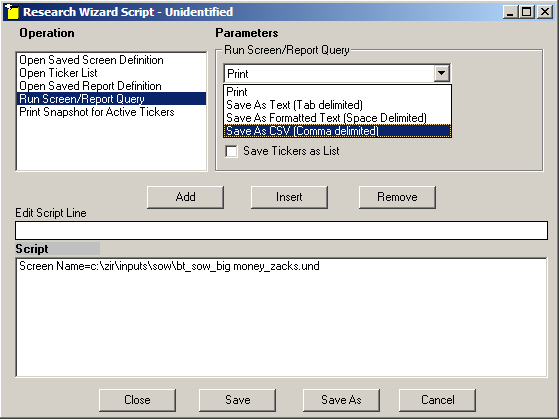 Then select the Run Screen/Report Query option. 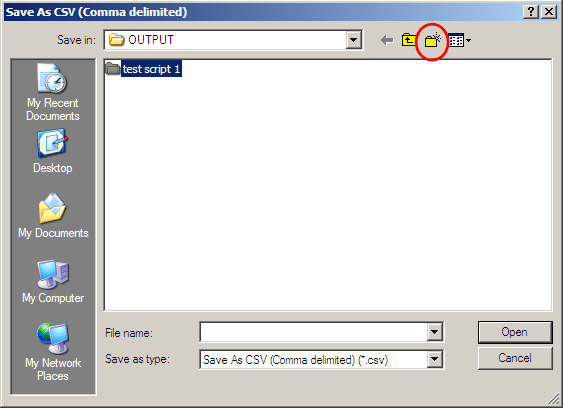 Under the Parameters / Saved Screen Definition section, select Save as CSV (Comma delimited). Then click the button so the Save as CSV window pops up. 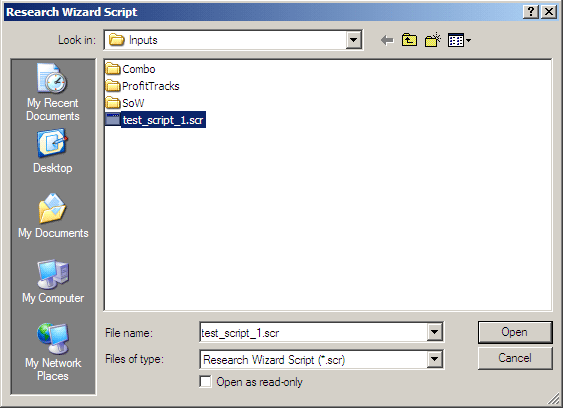 Double-click the ‘test script 1’ folder. 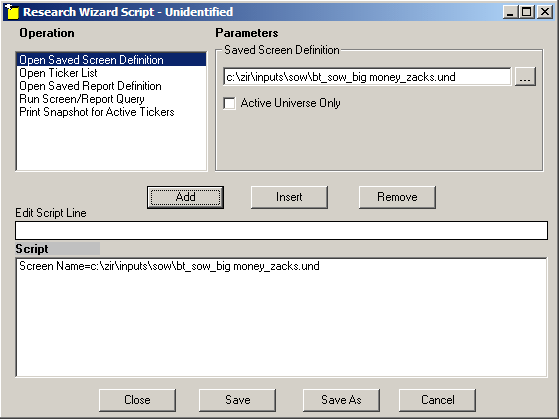 Create a name for then CSV file. For example: filtered zacks rank5. Repeat these steps for the rest of the screens you wants added, e.g., bt_sow_r_squared_eps_growth and bt_sow_toxic_stocks_2. Now it’s time to save it. Click the Save button and then give it a name. We’ll call this, test_script_1. Then Click the Close button to close the window. Now you’re ready to run your Script. On your Menu Bar, select Script, then Run Script. Note: To shorten the above steps to open those output files, you can create a shortcut on your Desktop for the ‘test script 1’ folder. you’ll be able to access that folder with one click. 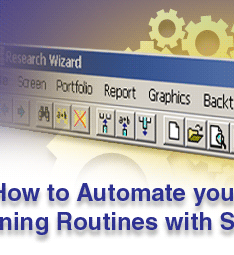 Automating your screening routines will be a convenience you’ll be able to enjoy over and over again. One of the key’s to stock picking and trading success is to stay on top of your portfolio, which includes monitoring your current holdings, rebalancing your portfolio and searching for new stocks that qualify your screens. Life can get busy. So the easier and more convenient you can make your daily tasks (not just in stocks but in life) the more likely you’ll do it. 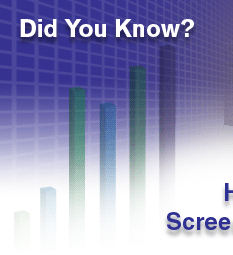 Try automating your screening and monitoring process today. And start benefiting from this time saving feature immediately.